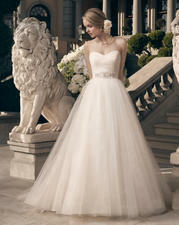 This ball gown features two layers of tulle over Printed Shimmer Tulle and Structured Tulle. The sweetheart neckline and low "V" back neckline have pleated organza under the layers of tulle to add dimension to the bodice. A ruched taffeta band sits at the natural waist and is beaded with Swarovski Crystals, rhinestones, sequins, pearls, and 3-dimensional organza flowers. Crystal buttons finish the back bodice to the end of the ruched band.